Power electronics is being brought into sharp focus as OEMs look to improve the efficiency of electric and hybrid cars. Many of the energy losses in such systems occur in power electronic systems (such as DC-DC converters) which convert the high voltages from the batteries to the correct levels for the various systems in the car. Prodrive are exploring the use of silicon carbide based components which can operate at much higher temperatures and efficiencies. To find out more, Matthew Beecham spoke to Pete Tibbles, Prodrive programme manager - power electronics. We believe that Prodrive has been involved in a consortium exploring the use of silicon carbide based components which can improve efficiency and operate at higher temperatures. Could you explain your solution and the stage you are at? What advantages in terms of weight, cost and packaging does your silicon carbide solution have over the conventional approach? Silicon carbide devices offer a significant reduction in switching losses compared to silicon. This enables them to operate at a much higher frequency than equivalent silicon components - at 75 kHz in the test vehicles - with a subsequent reduction in ripple current. This has resulted in a significant reduction in the size of the magnetic components and has enabled the converter to achieve a class leading efficiency of 98.7%, a gravimetric power density of 10.5 kW/kg and a volumetric power density of 20 kW/litre. Silicon carbide devices can also operate at higher temperatures providing the opportunity, with further development, for simpler and more compact cooling systems - or in the case of a hybrid vehicle, the sharing of the existing IC engine's cooling system. Were there any surprises when you tested the silicon carbide DC-DC converter? The silicon carbide devices were remarkably robust during testing of the prototype converter. The main technical challenge was the development of the high speed digital control system required to manage the higher switching frequencies and power flow. Who else was involved in the consortium and what did each bring? Prodrive - control electronics and software, vehicle converter design and manufacture, vehicle integration, project management. University of Manchester - converter topology, magnetics development, power circuit design and development, converter testing. Tata Motors European Technical Centre - demonstrator vehicle, vehicle interfacing, integration support. IST Power Products - magnetics design and manufacture. SCISYS - Open architecture interface software. Raytheon - Silicon carbide power module design and development. The consortium of companies is backed by Innovate UK (formerly the Technology Strategy Board). Any thoughts on by when could we see this silicon carbide solution in production? The aim of the project is to develop the multiport converter to a technology readiness level (TRL) of between 6 and 7, incorporating appropriate design verification testing, with a view to developing the technology to production readiness (TRL 10) in the next 2 -3 years. What's next for your consortium? The consortium is already working on a follow up project, due for completion in January 2015, which increases the DC-DC converter operating voltage to 750 V. This further increases power density and demonstrates operation at increased coolant temperatures. For this project a rolling test bed, based on a light commercial vehicle chassis, has been developed, which has a 75 kW traction motor. 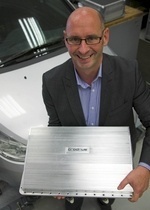 The energy storage consists of a 320 V Li-ion battery and two super capacitor banks, all of which were designed and built by Prodrive specifically for this project. Is there a role for your silicon carbide solution in a conventional IC engine?